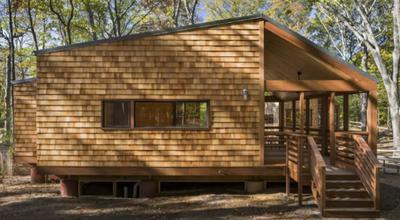 Can modern cabins entice new audiences into state parks? In an effort to attract new audiences to explore nature, the New York State Parks Department has invested in man-made design. 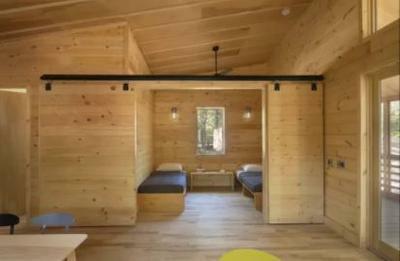 As part of a new effort to modernize cabins and make the park visit more accessible and accommodating, the department funded a series of new cabin prototypes that will be open for visitors later this year. 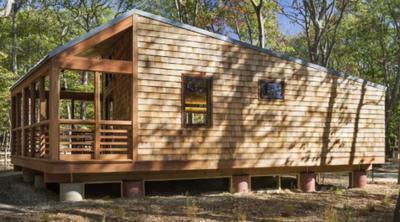 At sites at both Wildwood and Heckscher state parks on Long Island, these new dwellings will offer a contemporary update for overnight visitors, boasting sleek forms, natural materials, and open, light-filled interiors. Chandler previously spent a dozen years working for the New York City parks department, which has its own design programs. When new funding offered the opportunity to incorporate better design into state park property, Chandler seized the chance to hire an architect to make a statement, and ideally create a prototype that could be utilized for parks across New York. Chandler turned to architect Claire Weisz and New York-based firm where she’s a principal, WXY. Previously recruited by the parks department to reimagine and redesign shower and toilet facilities for the park system, Weisz loved the idea of designing public accommodations that could stand up to the weather and wear-and-tear of repeated use, attract a new generation of visitors, and adapt to modern needs. So far, the project will consist of 10 cabins in the woods of Wildwood, 670 to 784 square feet one- or two-bedroom structures with cedar shingles and reclaimed mahogany trim set to finish early this year, as well as 15 beachfront contemporary cabins for Heckscher, located on Long Island’s south shore, set to open later in 2018. WXY’s prototypes could be called a modern, lightweight adaptation of the concept. Cabins at Wildwood feature more open, wider floor plans, to better suit large families and meet modern ADA requirements, as well as light-filled interiors, larger windows, and unfinished natural wood surfaces, a reaction to older structures’s often dark and cramped layout. Durable, solid furniture, and a lack of ornamentation, speak to longevity and easy maintenance. At Heckscher, the waterfront cabins melded a variety of modern influences, such as Hamptons contemporary cottages and The Sea Ranch, while keeping the same focus on natural materials, such as stone and wood. They should reflect and respect the past, without offering up a pastiche, says Chandler. The buildings also needed to be easy-to-assemble, since models likely will be constructed by park rangers, as well as literally “above the landscape,” since in some ecologically sensitive places, adding foundations isn’t possible. Like adding new flora and fauna to an ecosystem, the cabins need to be “conscious of other things that have happened in the park,” says Chandler. As the prototypes go into service this year, Chandler and WXY will take feedback from guests and park staff and tweak future designs. Ideally, the structures will be replicated and used throughout the state, establishing a design program for the park service, akin to a similar initiative in California. Weisz says the structures were designed so they could eventually be prefabricated, offering utility and ease of installation, allowing them to be set up anywhere intrepid campers may want to explore. Join in and write your own page! It's easy to do. How? Simply click here to return to News portal.